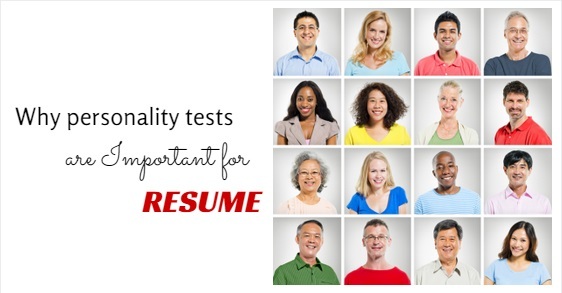 Why Personality Tests are Important for your Resume? Now you will find many people updating their personality test score in their resumes. Whether it enhances their chances or not, is a big debate that has been doing the rounds for quite a long time. There is no right or wrong types in anybody’s personality, instead the personality test is said to help you realize what your personality type is. The most popular and the best personality test now known is the Myers Briggs Type Indicator (MBTI). This assessment will help you understand the natural strengths of yours and the most common characteristics of yours. The importance of personality test will help you in acknowledging the preferences that come to you naturally. The result of the personality test can be applied to the professional life of yours as well. Here we have discussed clearly why are personality tests important. Depending on the recommendation from Myers – Briggs Type Indicator assessment, you will be able to get a hint about the choice of career you must take. This personality test helps you in realizing your strengths and applying for jobs accordingly. But, it doesn’t guarantee that you will be successful in that domain, instead it shows you the path which can help you excel by learning the required skills and getting adapted to the new environment. Depending on these preference types, 16 diverse personality types are produced. The test result will have the initial of the preferences, so upon the completion of the test, your result might show that you are an INFJ or you are an ESTP. This test doesn’t measure your aptitude, instead they are said to measure your attitude. While taking the test, you must relax and come up with an honest answer. Realize your core values, strength and also your limitations, so that you can get an appropriate result of the personality test. The hiring managers for recruitment, go through several factors like the education of the potential employee, their experiences, successes and many more aspects like these. But, how many of us provide the personality aspect in our resume? If the potential employer can go through the personality assessment results, then the organizations would be able to hire more efficiently and also avoid the expense of wrong hires, especially in the top level. Now most employers are turning to the personality test for getting the right candidate on board. A job is not only about completing the task, but it also involves working in a closely knit team. Therefore, if you are not able to accommodate with your colleagues, then it will hamper the productivity as well. But, if the personality trait of the candidate can be known beforehand, then this blunder can be avoided. If the personality trait shows that the candidate is not good with too many people around him, then the selection will be done in that way only. The personality test might turn out to be the most important step in the job search and it can also be the key to a successful career. Job searching doesn’t mean sending out hundreds of resumes. It will rather leave you frustrated after a certain period of time. Instead, take the test and get to know some unknown facts about your personality. It will help you in deciding what career choice will be perfect for you. Update your strengths in the resume and apply for jobs that will fit your personality and skills. When you have your strengths highlighted in your resume and a personality test result to support that, then it will help you in cutting down the stiff competition to a great extent. The MBTI will explore the personality traits that even you are unaware of. You will know your natural communication ability and the environment types that are best suited for you. So, when a hiring manager will go through your resume, they will know instantaneously how good or bad your communication skill is. Therefore, these types personality tests proves the point big time. When you have a complete understanding of your personality it will help you in targeting opportunities that you can pursue. Apart from this, it will also assist you in marketing yourself to the hiring managers through your resume. When you know your traits well, you will be in a better position to communicate why you are the best suited candidate for the job. Moreover, you are not lying, it is the absolute fact. The personality test will also recommend you industry where your personality will be best suited. Therefore, these will help you in exploring a new career path that will lead you towards the right career selection. The result will help you and also your employer in identifying why you are different and unique from others. When you update your personality trait on your resume, then it works like a competitive differentiator and helps you in making all the difference in your career. The personality tests are nothing to get scared off, instead they will show the potential employer whether you are a good fit for their organization and help you in grabbing the perfect job. In case, it shows that you are a misfit for the team, then don’t be disheartened, instead it will save you from working in a miserable environment.